The TIDA-00914 reference design realizes a reinforced isolated 3-phase inverter sub-system using isolated IGBT gate drivers and isolated current/voltage sensors. Precise in-line shunt based motor phase current sensing is done with AMC1306E25 delta sigma modulators. The modulator output is Manchester encoded which simplifies the clock and data signal routing between the MCU and modulators. High CMTI of the modulator helps suppress the inverter switching noise transients from corrupting the data on the controller side. The small size of the modulator enables a compact solution. The TIDA-00914 provides an interface to connect to an external MCU or FPGA where digital SINC filters can be implemented to demodulate the AMC1306E25 output bitstream. 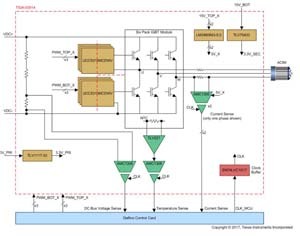 This reference design uses the F28379D delfino control card which is connected to the TIDA-00914 card through an adapter card to implement SINC filters for current sensing.